Watch City Council, Planning Commission, and Rent Control Board meetings live! If you missed the meeting you want to watch, you have several options. 1. Watch it online. 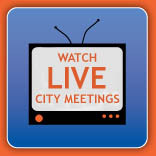 If you want a City Council or Planning Commission meeting, consider watching it on-line. You can go directly to the agenda item that you want. 2. Go to the Main Library. Council Meeting DVDs are available for check-out. 3. Buy a copy. Meeting DVDs are available for purchase at $20 each. Call (310) 458-8590 and place your order. If we have copies on hand, you may come by our office and pick it up the same day. If we need to make a copy of a meeting, it may take 2-3 days and we will call you when your copy is ready. Our offices are located at 1654 19th Street between Olympic and Colorado. 4. Borrow a copy. If we have copies onhand, you can leave a $20 cash deposit and borrow the tape. We will return your deposit when you return the tape. This option is only available is we have a copy on hand, not if we have to make a copy for you. Call (310) 458-8590 to check availability. Our offices are located at 1654 19th Street between Olympic and Colorado.